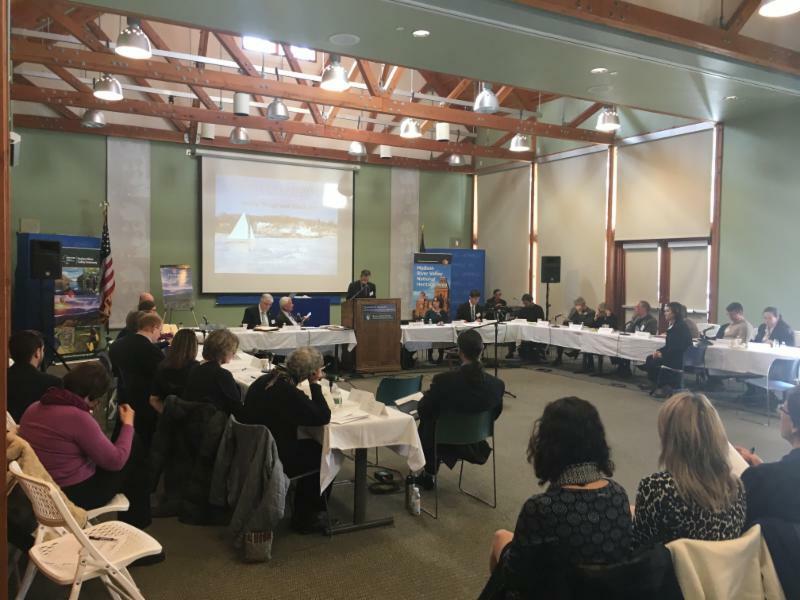 At its meeting on February 1, 2017 at the Henry Wallace Center of the Franklin D. Roosevelt Library and Museum at Hyde Park, the Hudson River Valley Greenway awarded grants totaling $47,500 to communities in the Hudson River Valley. Among the recipients were the Town of Cornwall, Orange County and the Town of New Scotland, Albany County. Each community was awarded $10,000 to update its comprehensive plan. The Town of Chatham in Columbia County and the Town of Blooming Grove in Orange County were both awarded $7,500 to implement comprehensive plans. The Village of Haverstraw in Rockland County was awarded $7,500 to prepare its Riverside Concept Development Plan, and the Village of Millerton in Dutchess County was awarded $5,000 for the Eddie Collins Park Revitalization Plan. The Hudson River Valley Greenway was awarded $200,000 in Empire State Development Market New York Grants for two initiatives. The first grant of $100,000 was awarded for the Hudson River Line Window Seat Tour. 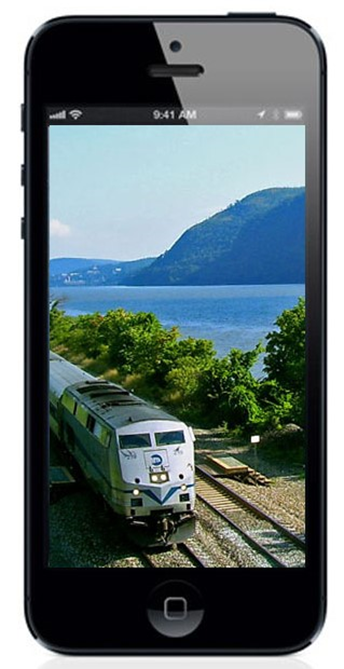 This project will create a hybrid downloadable app that will provide passengers on the Amtrak and Metro-North Hudson River Line trains a customizable, GPS enabled, real-time guided tour of the region's history, scenery, and natural resources right outside their window as they travel between New York City and Albany. The second grant of $100,000 was awarded for the creation of the Hudson River Sojourn. This event will be a multi-day kayaking trip between Albany and Manhattan for kayakers of varying abilities. Participants will have the opportunity to paddle throughout the entire eleven day journey down the river or participate on shorter single and multi-day trips during the event. The Sojourn is designed to promote the Hudson River and the Hudson River Valley as an ecotourism destination as well as to highlight the Hudson River Greenway Water Trail and communities along the river. In 2012 Governor Cuomo unveiled New York State's "Path Through History," a statewide initiative that links historically and culturally significant sites, locations and events throughout New York State. This effort to highlight our rich heritage aims to not only showcase the state's history and cultural significance, but also promote tourism and economic development in communities across the state. The Path Through History Weekend will be held this year in two seasons: in the Spring from June 17-18, and in the fall from October 7-9. Host sites can participate in one or both of the weekends, and registration is now open. Register your event here. Historic Preservation Workshops with the Greater Hudson Heritage Network. Workshops on the handling and care of historical objects as well as how to create positive visitor experiences will be held throughout the spring at several locations in the Hudson River Valley. Click here to find out more. On April 21-23, to celebrate Earth Day and the Erie Canal Bicentennial, the New York State Canal Corporation and Parks and Trails New York is organizing the 12th Annual Canal Clean Sweep . This year, the Canal Clean Sweep will kick off the 193rd consecutive navigation season on the New York State Canal System as well as the first year of the Erie Canal Bicentennial celebration. Register your event here . On Thursday, April 27, A day-long resiliency planning conference will be hosted at the Henry A. Wallace Center at the FDR Presidential Library and Home at Hyde Park. The conference will convene Hudson Riverfront stakeholders including municipal officials, community officials, land owners, planners, resource managers, regulators, developers, and private sector professionals to discuss issues pertaining to to the future and the unique natural and community resources of the Hudson River Valley. For more information, contact Laura Heady. Summer 2017 Internship Opportunity with the National Park Service LGBTQ+ Employee Resource Group. This is a unique opportunity for US citizen or permanent resident students aged 16-25 and currently enrolled in an accredited Historically Black College or University. Apply by February 10. More information here. The Northern Forest Canoe Trail seeks four summertime interns to work on this unique water trail that connects Old Forge, New York with Fort Kent, Maine. Apply by February 28. More information here. Join the Hudson Highlands Nature Museum for one, two, or all three events being held Friday February 10 thru Sunday February 12, at the Outdoor Discovery Center, on Muser Drive, across from 174 Angola Road, Cornwall. Enjoy a full-moon showshoe hike, learn the mysteries of winter weather, or stop in for a "Snow Day" including sledding and snow crafts. More information here. Exhibit of a 3-D immersive environment filled with the materials of a modern painter toiling in romantic obscurity in his studio. It is on display at the Hudson River Museum at 511 Warburton Ave, Yonkers. FULL STOP is ending soon on February 12. More information can be found here. The Influence of the Dutch Golden Age on the Hudson River School- February 12, 2017. More information is available here. Join Environmental Educator Carl Heitmuller for the evening to learn about the species of owls that are native to our region and their incredible adaptations. Meet a live owl from the Museum’s collection, then bundle up as you venture outdoors into the woods to search for these nocturnal raptors. February 19. More information here. Come celebrate George Washington's 285th birthday at the historic New Windsor Cantonment on February 20, 2017 from 10:00 AM to 4:00 PM at 374 Temple Hill Road New Windsor, New York 12553. There will be musket and cannon firings and children will have the opportunity to enlist in and drill with the Continental Army. More information is available here. Winter Wildlife Survival, Fort Montgomery State Historic Site, Fort Montgomery, NY February 20, 2017 at 1:00 PM. Have you ever wondered how animals survive the cold winters of New York? Now you can find out. Fort Montgomery State Historic Site is hosting a winter wildlife survival program. There will be a short nature trek in search of tracks and signs of animal activity as well as games and hands on exhibits of furs in this family-friendly program for ages 8 and up. More information is available here. This course leads to the NY State mandated boating safety certificate for operators born after May 1, 1996. Operators must be a minimum of 14 years of age and have this boating safety certificate to operate a personal watercraft in New York State. This free two day course is offered to boaters aged 10 and older on February 22 and 23 at 625 Broadway in Albany. It is highly recommended for all boaters and paddlers. Contact Ro Woodward at (518) 486-1880 to sign up. More safe boating courses are listed here. The life and work of the "First Lady of the World", Eleanor Roosevelt, is celebrated at her home, Val-Kill. Val-Kill is the only National Historic Site devoted to the work of a first lady. 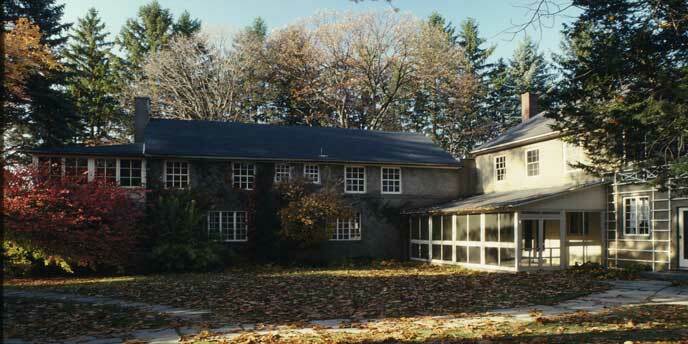 Mrs. Roosevelt purchased this property, which had previously been home to the traditional American furniture manufacturer Val-Kill Industries, in 1936. She converted the buildings into apartments for herself and her secretary and she would go on to use Val-Kill as a home away from the White House. She spent much time here during her husband's presidency and after his death she lived here for 17 years. Foreign dignitaries such as Winston Churchill, Jawaharlal Nehru, and Nikita Khrushchev visited Mrs. Roosevelt here. The property is filled with many of Mrs. Roosevelt's possessions and visitors can see how she lived during her years here. Val-Kill can easily be visited in conjunction with a trip to the Franklin D. Roosevelt National Historic Site, The Franklin D. Roosevelt Presidential Library and Museum, and Top Cottage (The FDR Retreat), all of which are located in Hyde Park. Information regarding a visit to Val-Kill can be found here. 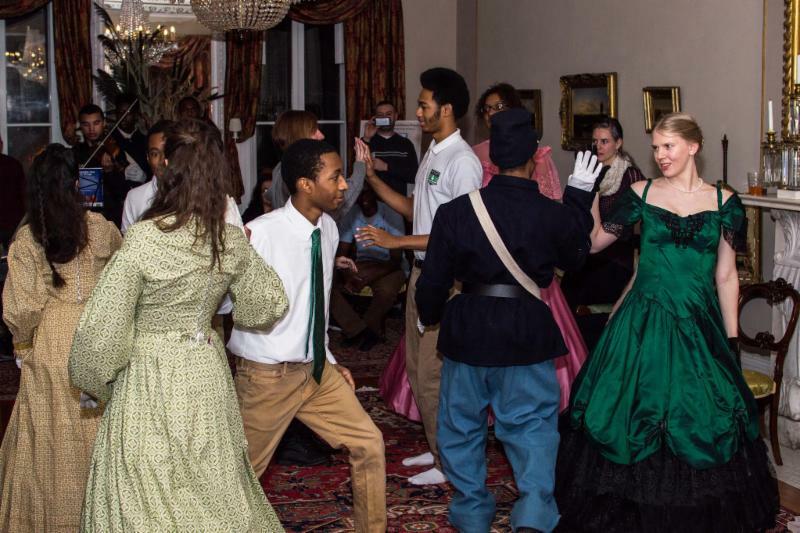 The Underground Railroad History Project of the Capital Region was awarded a $5000 National Heritage Area Heritage Development Grant for their Youth Experience the Underground Railroad and its Relevance Today project. This is an educational p rogram designed for school-aged children that emphasizes the historical significance the Underground Railroad played in the Capital Region in the years prior to the Civil War. The educational program is conducted in conjunction with a thematic tour at the Stephen and Harriet Myers Residence in Albany. 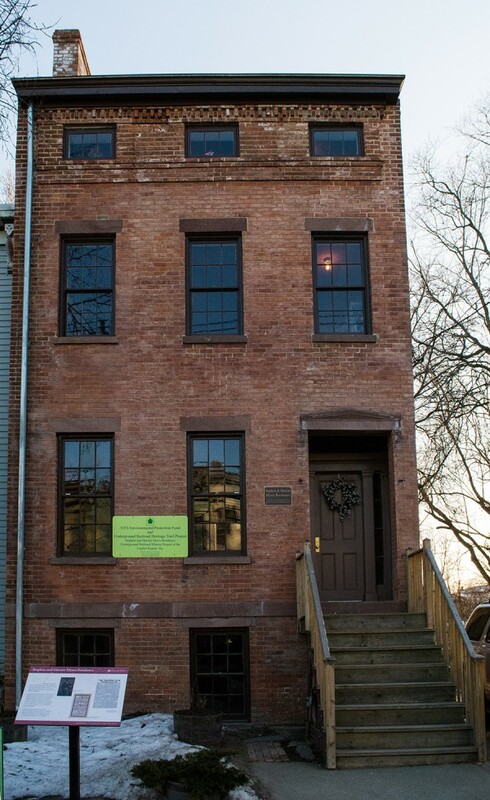 The Stephen and Harriet Myers Residence was home to leading Underground Railroad activists in the 1850's who assisted hundreds of escaped slaves on their journey to freedom in Canada. The site was listed in the National Register of Historic Places in 2004. More information about the program can be found here. Matching grants available for Greenway Communities and Greenway Compact Communities. Deadline May 5. More here. Hudson River Estuary Grants Program- Due April 6, 2017. Grants from $10,500 to $1,000,000 are for Tributary Restoration and Resiliency. These grants help communities in the Hudson River estuary watershed improve water quality, increase flood resiliency, and conserve natural resources. More information is available here. The Tibor T. Polgar Fellowship program is a student research program conducted through the Hudson River Foundation in cooperation with the New York State Department of Environmental Conservation. this program provides a summertime grant ($3,800 for each fellowship) and research funds (up to $1,000) for eight college students to conduct research on the Hudson River. Applications are due February 13, 2017. The Environmental Protection Agency (EPA) is making available funding to recruit, train, and place local, unemployed and under-employed residents with the skills needed to secure full-time employment in the environmental field. Applications due February 24. The Federal Transit Authority (FTA) is making available funding to facilitate the advancement, production, and deployment of zero-emission public transportation vehicle technology and related infrastructure. Examples include improving charging standards for battery-electric transit vehicles, improved passenger compartment heating systems, and expanding hydrogen infrastructure. Deadline February 21. The New York State Department of Environmental Conservation is pleased to announce funding for the Invasive Species Rapid Response and Control Grant Program. The program, which is open to municipalities, not-for-profits and educational institutions, will target both aquatic and terrestrial infestations throughout New York State. Deadline March 24. More here. These planning grants will assist communities that are currently in the NYS Department of State’s (DOS) Brownfield Opportunity Area (BOA) program in completing their revitalization strategies for economically distressed areas. Deadline March 1. More information here. The Hudson River Foundation will award up to six full-time research fellowships to advanced graduate students conducting research on the Hudson River system. Fellowships are available for doctoral and master's level students. Applications are due March 13, 2017. More information here. This is a competitive funding program for the development of Countywide Resiliency Plans that primarily address climate change risks and vulnerabilities associated with: an increase in frequency and severity of storm and precipitation events; sea-level rise; storm surge; and flooding. Deadline March 29. More information here. The Department of Agriculture (USDA) announced funding for approaches to benefit farming, ranching, and forest operations, local economies, and the communities and resources in a watershed or other geographic area. Program priorities include projects that address climate change, improve agricultural energy management and efficiency, and prevent flooding and drought. Deadline April 21. More information here. Proposals are welcome from organizations with ideas to help reduce greenhouse gas emissions and energy consumption from New York's multi-modal transportation system. Project areas include Smart Mobility Solutions, Smart Infrastructure and Systems Planning, and Smart Freight and Urban Delivery Systems. More here . State, federal, and private grant information from the New York State Assembly, for grants ranging from law and social science research, media projects, economic and social inequality studies, to suicide prevention research. More here . Parks and Trails New York and the New York State Office of Parks, Recreation, and Historic Preservation have teamed up to provide grants funded through the Environmental Protection Fund. More here . The New York State Council on the Arts and Greater Hudson Heritage Network have partnered to provide support for treatment procedures by professional conservators to aid in stabilizing and preserving objects in collections of museums, historical, and cultural organizations in New York State. More here . 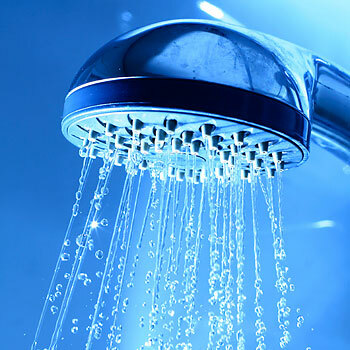 Did you know that the average family uses about 17% of their indoor water supply on showers? An easy way to save money on your water and energy bills and more importantly save about 3000 gallons of water per year is by simply replacing your traditional shower fixture with a low-flow shower head. More information on how you can save water can be found here.